Growing The Home Garden: Oh Deer! I thought the deer were gone but I was wrong. 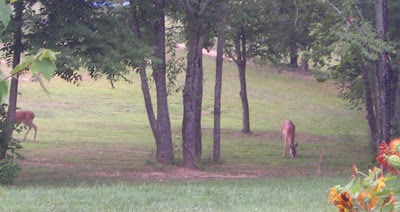 After a house was built behind the woods that skirts the edge of our property I thought the deer had left but when I returned home last weekend from my trip I discovered that the deer made a return. While they could easily make it into my vegetable garden they haven't yet. Maybe it's not worth jumping the fence to get my towering tomatoes, but most likely they just haven't found the garden yet. They did find, and dine on, a little red maple I planted in the back of our property. It should recover from its leaf stripping as long as the deer don't return for a second course. I put together a little present for the deer should they return. The crushed garlic and rosemary in an old sock tied to the little maple might do the trick, but then again maybe the deer will just appreciate the extra seasoning. Let's hope not!